Mont’Kiara is a sought after address for high-end condominiums. The best way to check out a location is to take a drive. If the aim is to determine whether the place is occupied, take that drive at night. And so there is Mont’Kiara ahead of you, nice and sprawling, with a lot of high-rise condominiums, many of them in darkness. The older and more established ones are about three-quarters full, the newer ones are struggling at between 30% and 50% occupancy. With about 2,000 units added to the market this year, this general average could fall further, says Regroup Associates Sdn Bhd executive director Paul Khong. As the economic crisis deepens, questions about the state of some locations have risen. Ireka Corp Bhd has been, by far, the most forthright developer about the situation there. Though cautious, executive director Lai Voon Hon admits it will not be rosy for the short term. Ireka has built about 2,000 units there. “We will see a slow down in the property market in terms of sales volume. That is a result of people’s confidence. But the present scenario will not be as bad as the last 1997/98 Asian financial crisis,” says Lai, who has chalked up six projects there, some of which are joint-ventures with Singapore’s CapitaLand group. Because of the tough times across the board, buyers are taking a wait-and-see attitude with big purchases such as these. “Sales have been slow,” says Lai. There are about 6,800 completed units there. The ongoing projects will comprise another 5,000 units, out of which about 2,200 units will be handed over this year. Both developers and analysts say prices there have not gone up as quickly or significantly as KLCC. Most of the prices are close to construction price and land cost. “Developers are not making super profits. Even if they drop, it will settle at a fair level,” says Lai, adding that the normal profit in Malaysia generally is 5% to 30%. While Lai and the real estate fraternity believe Mont’Kiara will ride out the downturn, there are several issues brewing there. Several weeks ago, StarBizWeek highlighted the situation in KLCC. But while that location boasts emblems of Kuala Lumpur’s boom and the glittery lifestyle it will one day spawn, Mont’Kiara is not iconic. For more than a decade, expatriates have singled out Mont’Kiara when posted to Kuala Lumpur. They still do. Most of the projects have a large expatriate community that accounts for about a third or more of its occupants, a fact that Sunrise Bhd used to be very proud of some years ago. Sunrise built about 4,000 units of condominiums there, about half of what’s available today. It is the largest developer there. With retrenchment high on the list, some of them may be going home. Those who bought earlier are also expected to convert their assets to cash. Agents and valuers have mixed views how much prices have dropped but the range is between 5% and 20%, depending on the project, from its peak. There are different grades of condominium in that location, with prices ranging from about RM450 per sq ft to about RM900 psf. If prices and rental continue to spiral downwards, the older units will suffer. Says Khong of Regroup: “We are currently looking at about 10% to 15% drop in rental rates from the peak at this moment and would expect it to move southwards a bit more when the bulk of the uncompleted units come into the market. Another consideration when buying into that market is Mont’Kiara’s neighbour, Sri Hartamas. The two largest developers there are Hong Kong-based Mayland group which developed the Plaza Damas shopping mall, and Dutaland group with its upcoming Kenny Heights project. While Mont’Kiara units range between 1,200 sq ft and 3,000 sq ft or more, the units offered by Mayland average about 500 sq ft. On a per acre basis, this means there will be more units. At this point, the developer has already built 1,800 units above and around Plaza Damas. Another 1,500 units will be added to the Sri Hartamas market in about three years when it completes Hartamas 3, which is located across Plaza Damas. Dutaland has about 90 acres in Hartamas. It is also expected to have high-rise in that location. While the location is holding out well, the pressure is mounting. TH Properties Sdn Bhd is confident that the location of its latest project, Bandar Enstek, will attract and boost sales despite the current economic slowdown. Located 10 minutes from the KL International Airport (KLIA) and 20 minutes from Putrajaya and Cyberjaya, the township is well connected to highways such as the North South Expressway and Express Rail Link. Chief executive officer Zaharuddin Saidon says about 60% of the buyers are civil servants working in Putrajaya while the remaining worked at the KLIA and other parts of the Klang Valley. Although the country is starting to feel the impact of the crisis, the company’s target buyers, who are mostly civil servants, are still secure in their jobs, he says. Bandar Enstek comprises residential, commercial and industrial properties with a gross development value of RM9.3bil. It is scheduled for completion in 2025. TH Properties, which has 20 years’ experience as a developer, has other projects including Bandar Muazzam Shah in Pahang and Warisan Puteri township in Negri Sembilan. Bandar Enstek is now the biggest development undertaken by the company. The houses at Bandar Enstek are priced from RM170,000 for single-storey houses, RM250,000 for double-storey terrace houses, RM300,000 for super link houses and RM600,000 for bungalows. “TH Properties is the only developer in the country to offer a five-year warranty for any of its properties. “Our gearing is zero and our funds are all internal. That’s why not a single project by us has been abandoned, “ he says. Going forward, he says, TH Properties plans to unlock land belonging to its parent Tabung Haji for development purposes. It is also moving into other international markets such as Saudi Arabia. The company will be launching a new commercial building in Kuala Lumpur by April. To hold back Malaysia from slipping into a recession, the Government has unveiled an unprecedented RM60bil stimulus package, dubbed the mini budget, on Tuesday. But just how effective the measures will be in arresting a decline in consumption and giving a boost to the economy is largely dependent on the speed, efficiency and transparency in the implementation and disbursement of the allocated funds to the targeted industry groups and population. The sooner the funds are disbursed to the critical sectors, the higher the chance of them being put to good use to retard the fast deteriorating economic and business environment. Going by the massive debilitating impact of the US-led global financial crisis to the economies of countries around the world, Malaysians and the business people will likely remain concerned over the extent of the impact to the country’s economy in the medium term. They are not about to lift their guard and start spending just yet as many uncertainties, including potential job cuts and business failures, are still looming and posing a real threat to a demand-led recovery. As such, the latest measures are not expected to result in a quick recovery in consumption and the economy but it will take time before the funds are trickled down to the people. 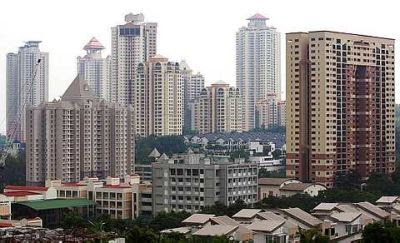 Property industry players lamented that the proposed tax relief on interest payment for property buyers will not have a significant impact on property sales as most established developers have already introduced end-financing schemes which fully absorb interest cost during the construction period. Under the latest measure, the Government has proposed a tax deduction of up to RM10,000 per year be given on housing loan interest for house purchased from developer or third party. The incentive will be given for three consecutive years from the first year the housing loan interest is paid but is only applicable to resident Malaysian citizens and limited to one residential property with sale and purchase agreement signed between March 10, 2009 and Dec 31, 2010. Given that the interest saving will only be realised in arrears upon filing of annual tax returns, it is less impactful compared with what the developers are already offering under their 5/95 or 10/90 house financing programmes where house buyers only need to come out with minimal down-payments of either 5% or 10% of the property price, while the full interest payment over the construction period will be borne by the developers. The tax incentive may at best cushion the impact of falling sales rather than boost it. To maximise the benefit of fully utilising the tax relief amount of RM10,000, a buyer has to sign up for a house priced at more than RM385,000, while buyers in the low-end segment of property priced at less than RM100,000 will not stand to benefit due to their non taxable income bracket. Developers were in fact hoping for government grants for first-time house buyers of affordable housing priced at less than RM300,000; further relaxation of Foreign Investment Committee rules, particularly for commercial properties; and a waiver or reduction in stamp duties for homes priced above RM250,000. Meanwhile, expectations of corporate and individual tax cuts also did not materialise. With interest rate currently at record low, housing affordability has in fact improved but the main concern of house buyers is the uncertainty of the economic environment as well as their job security. For a recovery in the property sector, we have to let the dynamics of the market to come into play where supply and prices have to fall to a level from where the next market upturn will take place. Temporary measures to boost property demand especially high-end and speculative type will only prolong the problem as supply of property currently outstrips demand. It looks like more effective measures are needed to address the many challenges facing the property sector which has seen a severe contraction in sales since the crunch of the global financial crisis reached the country’s shores in the third quarter last year. Policy measures should focus on reviving the underlying economy in order to have any effect on the people’s confidence and market sentiments. Besides allowing housebuyers who have been retrenched to defer the repayment of housing loans for a year, hopefully the government will do more to improve the housing affordability of the low to middle income group to stem the risk of rising non-performing housing loans and massive housing foreclosures from happening. Deputy news editor Angie Ng believes that property, being a tangible asset, remains one of the most viable investment instruments around during the good and bad times. IGB Corp, Malaysia's biggest owner of commercial properties, rose the most in more than two weeks in the local bourse after Citigroup Inc said investors should buy shares of asset-owners instead of developers. 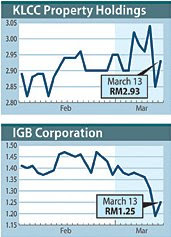 Shares of IGB jumped 5 per cent to close at RM1.25, the most since February 24. It's the best performer on the benchmark Composite Index, which climbed 0.6 per cent. KLCC Property Holdings Bhd, owner of the Petronas Twin Towers in Kuala Lumpur, rose 2.8 per cent, the most in a week. "We prefer companies with grade-A office exposure and property investment activities, versus developers," Citigroup said in a report yesterday. IGB and KLCC are its "top picks", it said. Property asset owners with long-term leases have more "defensive" earnings that will better shield them from the slumping economy compared with developers such as SP Setia Bhd which will be hurt by dwindling home sales, HwangDBS Vickers Research Sdn Bhd said in a note to clients yesterday. Malaysian Deputy Prime Minister and Finance Minister Datuk Seri Najib Razak this week warned that the Southeast Asian nation's economy may shrink this year for the first time in a decade and announced a RM60 billion stimulus plan. IGB shares also climbed after the Employees Provident Fund, Malaysia's biggest pension fund, bought 1.2 million shares in the company, lifting its stake to 8.1 per cent, a stock exchange filing showed on Thursday. SP Setia, Malaysia's largest property developer, dropped 3.1 per cent to RM3.08, the lowest level since December 26. Construction of the new RM2bil low-cost carrier terminal (LCCT) is expected to commence by mid-year for completion in the third quarter of 2011, says builder and operator Malaysia Airports Holdings Bhd (MAHB). MAHB managing director Datuk Seri Bashir Ahmad says the project will be funded by the company via loans. Datuk Seri Bashir Ahmad briefing the media on the new LCCT-KLIA. “We have no debts so it is no problem to raise funds,” he said at a media briefing in Subang yesterday. To this end, Bashir says the company already has the offer letters. Contracts to build the new terminal will be tendered out over the next few months, he adds. The new LCCT, to be built near the KL International Airport (KLIA), will be able to handle up to 30 million passengers when operational, with the potential for 45 million passengers per annum. Low-cost carrier AirAsia Bhd and Sime Darby Bhd’s proposal to build a new LCCT costing RM1.6bil in Labu, Negri Sembilan, was rejected by the Government last month. Bashir says the current LCCT will be converted into a cargo terminal. As for possible lower charges at the new LCCT, Bashir says: “All aeronautical charges will be decided by the Government. To a question on why the cost is higher than the originally proposed RM1.6bil by AirAsia and Sime Darby, Bashir says this is because the terminal will be “bigger” and with more facilities. “The design of the terminal, to be located 1.5km away from the main KLIA terminal, will have to be worked out but the construction of the new runway can start immediately. “We are talking to the airlines and finalising the design,” he says, adding that the terminal can be used by both low-cost and full service carriers. To a question, Bashir says MAHB is in discussions with Express Rail Link Sdn Bhd to extend its current connection to the new LCCT. On the 50% rebate in landing charges as announced in the mini budget earlier this week, Bashir says it will not affect the company’s bottomline. “We are working with the Government on a revenue-sharing basis for the landing charges,” he says. MAHB currently makes RM180mil to RM200mil a year from landing charges. 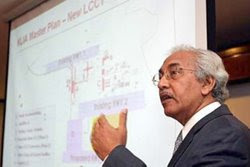 Responding to another question, Bashir says MAHB had in August 2007 appointed the joint-venture company of Netherlands Airport Consultants BV and KLIA Consultancy Services for the preparation of a National Airport Masterplan for the country, which included the development of a LCCT. “It took us 16 months to study this (LCCT plan). We did it professionally,” he adds. Other than KLIA and other domestic and international airports in Malaysia, MAHB also owns stakes in several foreign airports, including India’s Delhi International Airport. It also has other businesses, such as retail.